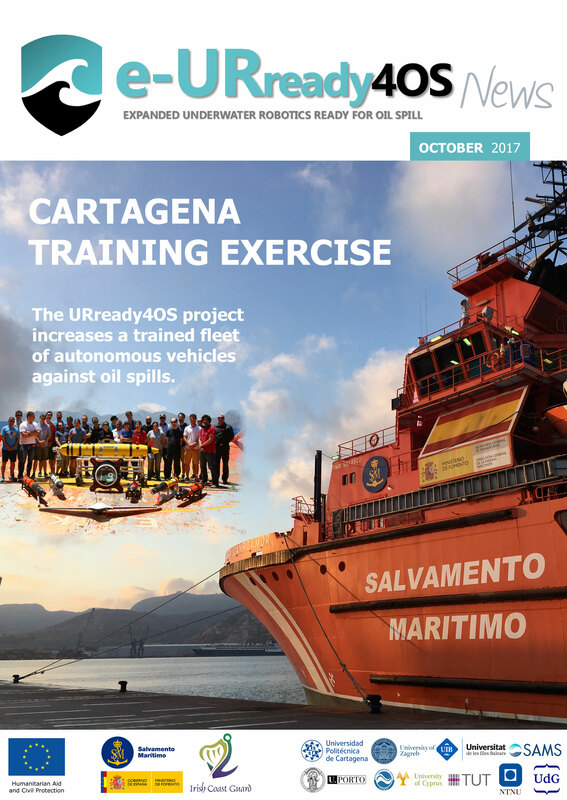 The project EC DG-ECHO funded “Underwater Robotics Ready for Oil Spills –URready4OS” (ECHO/SUB/2013/661056 URready4OS – http://www.upct.es/urready4os) provided a proof-of-concept to use a fleet of autonomous underwater vehicles (AUVs), unmanned aerial vehicles (UAVs) and unmanned surface vehicles (USVs) with operational capability to intervene against oil spills in European Seas using new cooperative multivehicle robotic technologies. The challenge of the new e-URready4OS project is to provide a larger number of trained teams as to be better prepared to deal with an emergency. Underwater robotics is widely used in the military and scientific domains, but not yet by Maritime Safety Agencies (MSAs). Our proposed strategy to accelerate the use of robotics against oil spills is twofold. 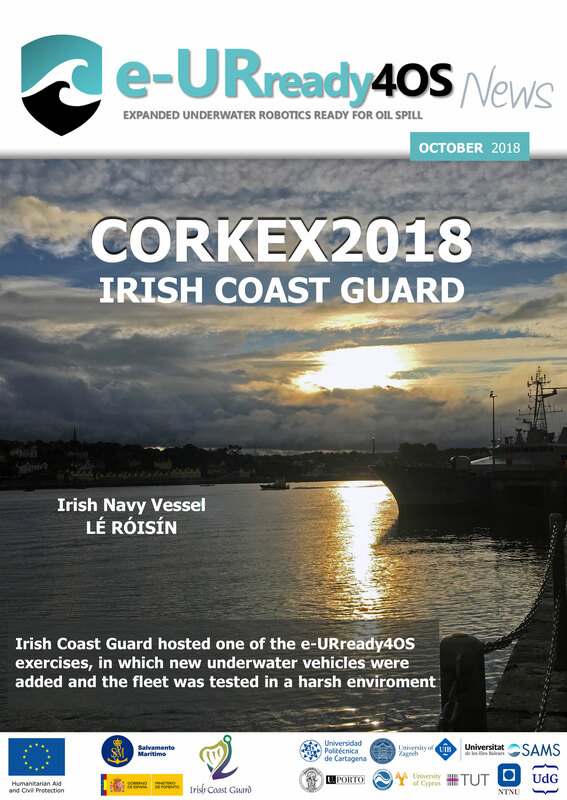 On one hand, we have expanded the number of different countries trained teams with available vehicles from universities and research centres to increase the capabilities to handle an emergency elsewhere in European Seas. Secondly, we will transfer the know-how of these institutions to MSAs performing training exercises on board of their rescue vessels and giving courses to their technical personnel in charge of this technology in a near future. Surface oil is not the only effect of an oil spills. Underwater oil plumes can come from bottom leaks and from surface patches forming subsurface plumes as recently been brought into the public eye during the 2010 Deepwater Horizon incident. This approach will allow us to use relatively lowcost standard sonar and oil-in water sensors, with novel advanced algorithms to get the most out these devices. The distributed intelligence of these devices across the spill will then be able to build up a highly accurate and dynamic image of the spill. The robotic system will also be able to self-organise to improve the monitoring of the oil spill. Ultimately, this cooperating multivehicle robotic technology will allow a cheap, flexible, expandable, precise and rapid decision support system for Civil Protection decision makers, improving the capacity of responding to these events. Whilst every effort has been made to ensure the accuracy of the information contained in this publication, neither the EC, nor the authors and their respective institutions past, present or future warrants their accuracy or will, regardless of the negligence, assume liability for any foreseeable or unforeseeable use made of the publications on this website. Consequently, such use is at the recipient’s own risk on the basis of this disclaimer. Either the EC or the authors and their corresponding institutions have no legal liability for the accuracy, adequacy or effectiveness thereof and assume no liability for any loss resulting from errors or omissions arising from the use of inaccurate or incomplete information or misrepresentations. Any use that a third party makes of the documents, or reliance on, or any decision to be made based on it, is the sole responsibility of such third party. The project accepts no responsibility for damages, if any, suffered by any third party as a result of decisions made or actions taken based on the documents contained on this website. The project does not engage in research for advertising or sales promotion.